Coming to Blue Lagoon Resort in your yacht means no foo-foo punch welcome, but our cost to stay is zero. We’re fine making our own foo-foo punch, even if ours isn’t nearly as pretty. Fiji Yasawas. disembarks its Nacula passengers. Fiji. 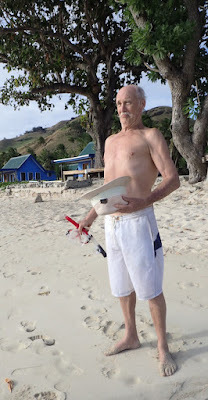 Fiji Yasawas’ Blue Lagoon…. Its reputation is legendary; from Brooke Shield’s career-launching movie site to travel guidebooks to Soggy Paws Fiji Compendium. 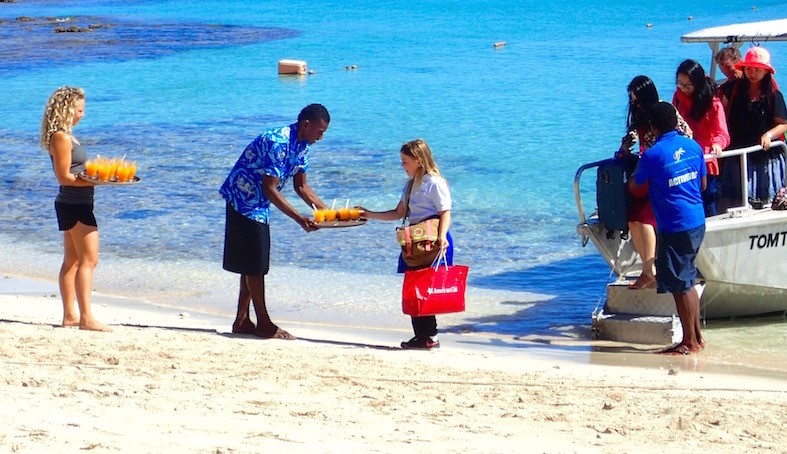 Yet, when it comes to finding cruising gems, it’s tough to beat recent, sufficiently detailed tips (why you’d bother, how to get there, what the anchoring is like and what weather protection is available) from cruisers we’ve learned to trust. Rich and Cyndi of Legacy’s awesome favorite New ZealandBay of Islands favorite cruising spots was, well, spot-on! When we read their intriguing post about a neighboring alternative to Blue Lagoon, we decided to give “The Other Blue Lagoon” a go. 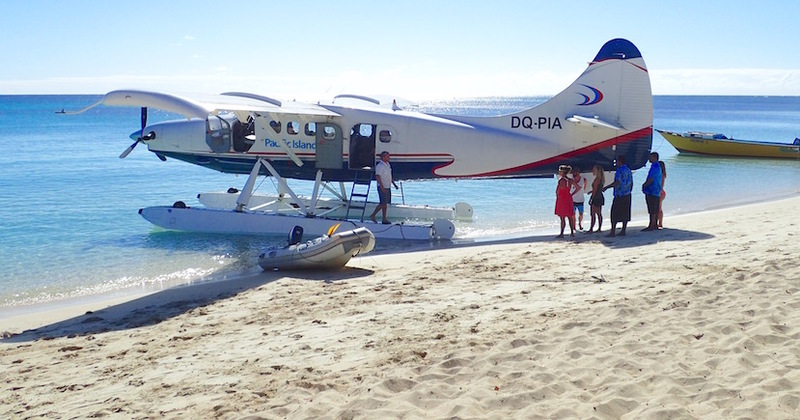 Pacific Islander, the plane with a boat-like name, makes its daily passenger stop on Nacula. The more traveled Blue Lagoon is off Nanuya Lailai. In the same island cluster. Less than 3 miles away, off two Nacula Island resorts, Blue Lagoon and Oarsman, is a sandy Shangri-La between two reefs. Our chart plotter showed the entire area as anchoring-unfriendly reef. Then again, Fiji’s oceanicdata, which most chart plotters rely on, is notoriously inaccurate. Thanks to the excellent Google Earth image in Rich and Cyndi’s post and a good daylight sail in, we were able to navigate our way in, anchoring on a huge sandy, nearly bommie and rock-free shelf at about 20 feet. We caught Oarsman’s lunchtime guest serenade. Nice! Nacula Island, Yasawas, Fiji. We liked Blue Lagoon Resort so much, we stayed 4 days. We were the only sailboat there the entire time. Soaking up the sun and splendid scenery of golden hills and turquoise waters, we lazed on our boat, on the beach, at the resorts. 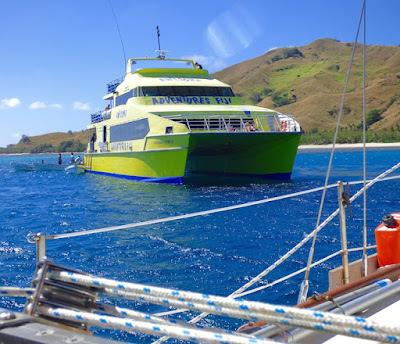 We watched the Yasawa Flyer (a boat) and the Pacific Islander (a plane – seems these two businesses should swap names!) disgorge and collect passengers daily. 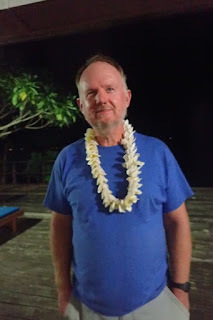 I kayaked and snorkeled (more on Blue Lagoon Resort underwater in another post). We trekked on two separate hikes (more on those in a future post), one to vista points, the other mostly along the shore, and out to the resorts on another portion of the island. Though all we did was order a beer or two, Oarsman’s staff treated us like extended family members. We stayed long enough to enjoy the Legacy-recommended Oarsman’s Friday night lovo. 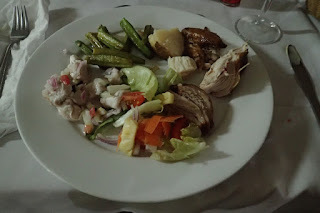 For only $15 USD/person, it was the tastiest underground oven-cooked meal of all we’ve tried to date. Even the okra, generally not my favorite veg (unless it’s pickled or part of a jambalaya) was phenomenal! Both Wayne and I couldn’t resist a generous second helping. The local roving song and dance troupe was not that polished compared to others we’ve seen, but what they lacked in that department, they more than made up for in warmth. We also enjoyed getting to know Alan, a Whangarei-based Kiwi vacationing at Oarsman. Local villagers passing through were equally happy to strike up a conversation, graciously inviting us to come by their village (which we never did get around to). 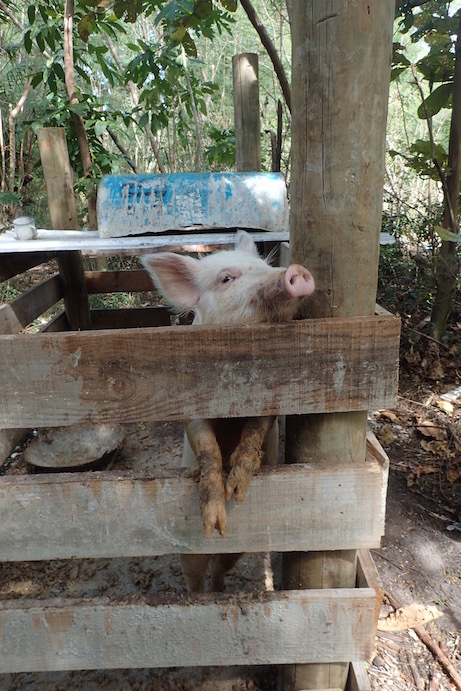 Even this Oarsman pig was friendly. if he was part of our lovo. Neighboring Blue Lagoon Resort was much more upscale… a fancier restaurant, swimming pool and grounds, a dive shop, guest-reserved chaise lounges on the beach and a float-y playground. Ironically, Oarsman had the better beach. Again, for the cost of an over-priced beer, we could hang with the gang. If you’re in Fiji’s Yasawas Blue Lagoon area, like Cyndi and Rich, we recommend you expand your vistas to include anchoring a while off Blue Lagoon (and Oarsman) resorts and enjoy Nacula. We’re glad we did! Thanks again, Cyndi and Rich for introducing us to your little piece of paradise! Oh and be sure to check out the beautiful turquoise water photos they took! roast pork, roast chicken and fresh fruit for dessert. 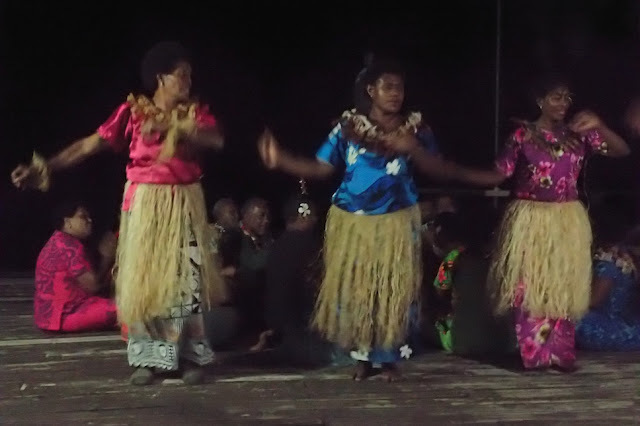 Some of the local dancers for Oarsman’s lovo night. They lured all the guests onto the dance floor with them for the finale. 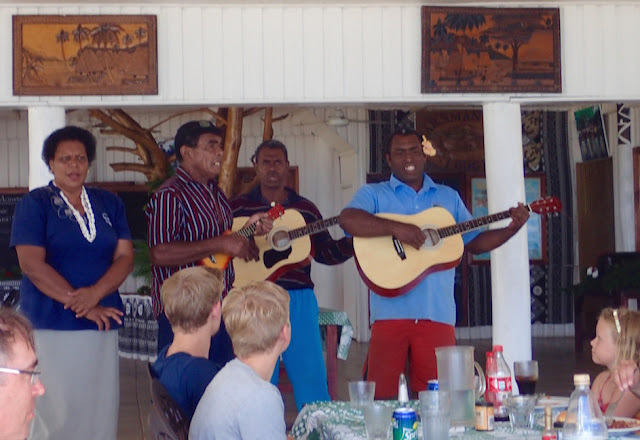 Fiji, Yasawas, Nacula Island.